SEO could be an effective way to upgrade your position in the Google search engine results. With various efforts you can tune the Google rankings in your advantage, for example linkbuilding, on-page SEO and other techniques. We all know that a high position in the Google rankings can help you to gain more trust, get more traffic and in the end it could lead to more sales and conversion. This is the reason why you should always work on improving them. 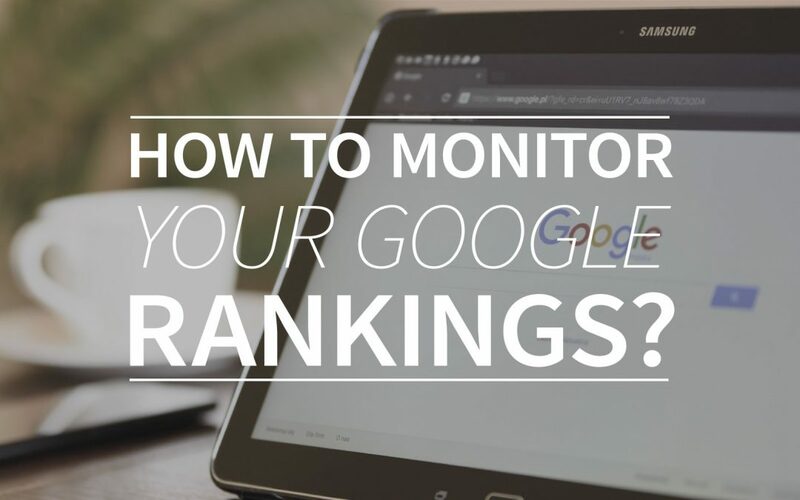 But how can you monitor your Google rankings and the growth (or drop) that you make by making certain choices? That’s what we’ll tell you today! What are the best steps to influence your Google rankings? First, before we even think about measuring the results, you should learn to understand what kind of changes have influence on your ranking. Like we briefly explained in the intro of this article, there are many techniques and choices that you can make, that create growth or a drop in the search engine rankings. 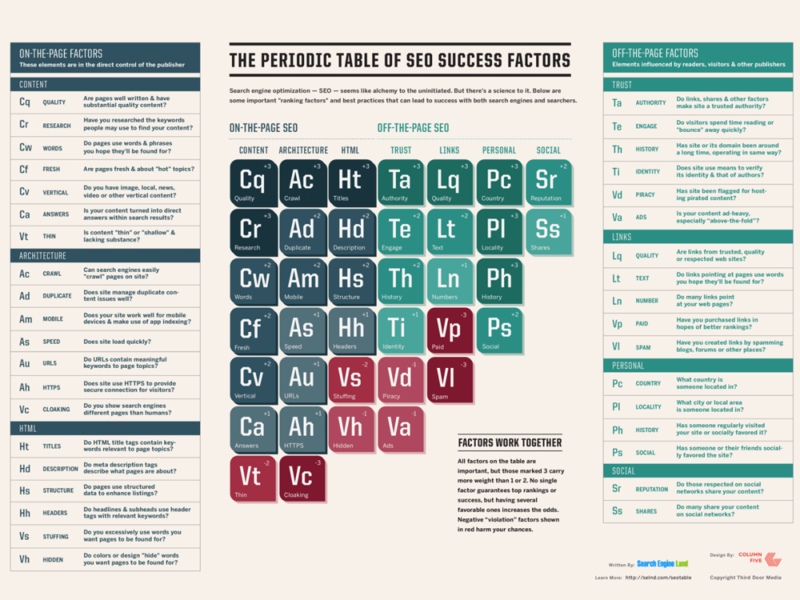 Our personal favourite scheme to explain this to you is the well-known “The periodic table of SEO success factors” by Search Engine Land. This scheme shows exactly what you should check, do and shouldn’t do to rank high in Google. For example, in the ‘ON-THE-PAGE SEO’-box you’ll find the factors ‘content’, ‘architecture’ and ‘HTML’. Under each of these factors you’ll find little boxes with the so called ‘influencers’ that you should check if you want to make sure that you get the best out of these ranking factors. The first one under ‘content’ is the influencer ‘Quality’. Are the pages on your website well written & do they have quality content that has a value to your website? Check this influencer to make sure that Google sees the value of your content as much as you and your customers do. The ranking factors are also influenced by the so called ‘penalty’s’. Under the ‘content’ ranking factor you can find the penalty ‘Thin’. This means that, if Google and your visitors find your content to be ‘thin’ or ‘shallow’ or lacking substance, you’ll be punished with a drop in the search engine results. How can you measure the impact of SEO? If you decide to actively try to influence your Google rankings, we could understand quite well that you would want to see the impact of your actions on the Google search engine results. It would be a pity if you find out that all your efforts are for nothing, or that you apparently do something wrong. For the clearest measurements it’s smart to determine some goals and choose your SEO efforts that you want to measure. For example, if you want to see how your webpage about ‘garden tools’ will rank after changing the ‘quality’ and ‘keyword’ influencers with your ‘content’ ranking factor, it’s smart to determine what kind of results you hope to get out of these changes and the time that you’ll put into this. Watch out! Be realistic, your page won’t rise from the 100the position to number one in just one week. If you’ve activated the page tracker, you’ll be able to see the current position of your webpages. After you’ve noted this in some kind of document, you should start with your SEO efforts for the determined amount of time. After your SEO efforts you’ll take a look at the results and evaluate if this is what you expected. Did your page rank higher the way you expected? Or are there still thing you should change before you’ll reach the goals that you set for yourself? With this output you’ll be able to start again with step 1, by determining new goals based on your previous results.